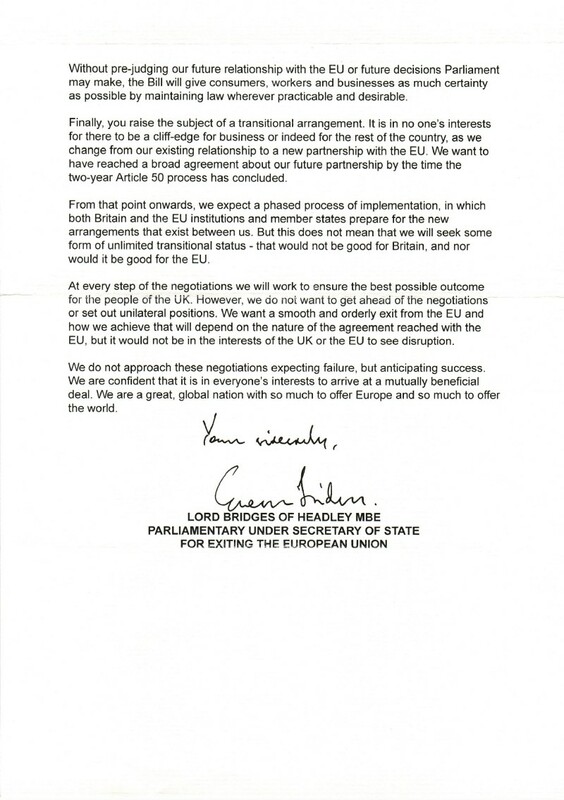 Earlier this month I wrote an email to Lord Bridges of Headley, with some suggestions on how to make Brexit a tiny bit safer. Today, in the post I got a letter in reply (on fancy paper and everything). The reply basically regurgitates stuff we already know from the white paper and speeches, it is the government line. That said, they got my email, someone read it, and they will carry on regardless. I do want you to make a success of Brexit, but I just don’t think the government is going in the right direction. There are some steps you could take to reassure people that the government has got the capacity to do the work required. I want the government to present a fully worked example of how they would calculate our external schedule of tariffs and quotas for several interesting products (beef & citrus perhaps as that touches on quantitative tariff breaks and seasonal protectionist tariffs for a product we don’t produce), and a plan on how they intend to complete that work in the two year timescale before starting the clock ticking. 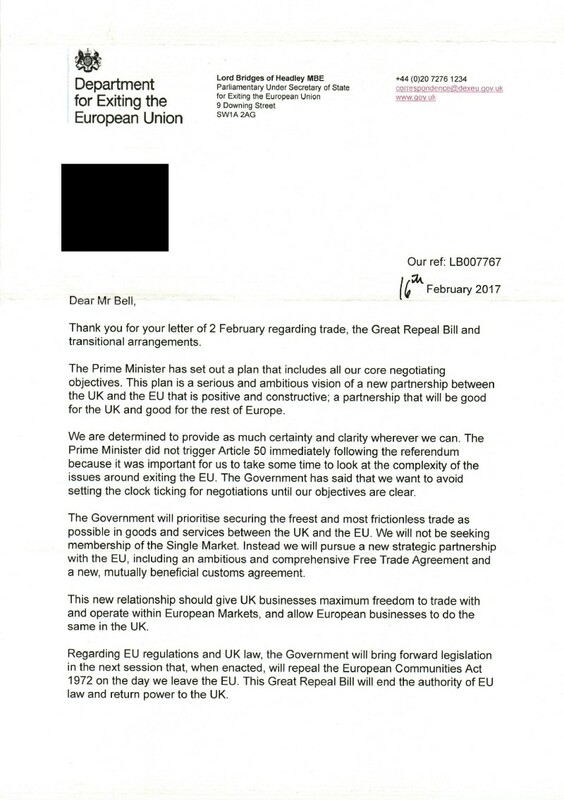 The second thing I want them to do is to present a fully worked example of transposing an EU regulation into UK law, as they intend to do under the great repeal act. This would expose various problems and things that become illegal to do in the UK under UK law because we are not a member state, or it would require our courts to notify EU member state courts in ways that can’t be reciprocated if we are not a member state etc. Plus they should present a plan on how they intend to complete that work in the two year timescale before invoking article 50. Thirdly I would like the government to explain in detail what a transitional arrangement is. What goes on the front cover of the document it is written in? Who is a party to it? What gives it legal effect? What can and can’t be covered in a transition. Normally transitions are written in the destination treaty, if we are going to WTO rules then there is no destination treaty in which to write them. The government needs to explain how they think this will work before invoking article 50. None of these in any way whatsoever expose the government’s negotiating strategy or weaken our position. Every one of them strengthens the credibility of our “walk away” option.